The work of a master critic writing at the peak of his powers, this magisterial book draws on speech act theory, as it originated with J. L. Austin and was further developed by Paul de Man and Jacques Derrida, to investigate the many dimensions of doing things with words in James's fiction. 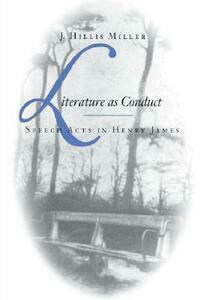 Three modes of speech act occur in James's novels. First, James's writing of his fictions is performative. He puts on paper words that have the power to raise in the reader the phantoms of imaginary persons. Second, James's writing does things with words that do other things in their turn, including conferring on the reader responsibility for further judgment and action: for example, teaching James's novels or writing about them. Finally, the narrators and characters in James's fictions utter speech acts that are forms of doing things with words- promises, declarations, excuses, denials, acts of bearing witness, lies, decisions publicly attested, and the like. The action of each work by James, he shows, is brought about by its own idiosyncratic repertoire of speech acts. In careful readings of six major examples, "The Aspern Papers," The Portrait of a Lady, The Awkward Age, The Wings of the Dove, The Golden Bowl, and The Sense of the Past, Miller demonstrates the value of speech act theory for reading literature. J. Hillis Miller is UCI Distinguished Research Professor at the University of California at Irvine. One of the most recent many books is Speech Acts in Literature.